If you're trying to figure out the best way to train a dog, the many different dog training options can be confusing. Should you try to train your dog alone or using dog training books? Should you go to group training classes or try private training sessions? Or, perhaps you should send your dog to stay with a trainer. Understand more about boarding and training to decide if this is the right approach for you and your dog. What Is Board and Train? Board and train is a type of dog behavior training that typically takes place at a dog training facility. Usually, the dog stays there for anywhere from a few days to several weeks depending on the program. While there, a dog trainer works with your dog to teach it basic obedience and address some common behavior problems. At the end of the specified amount of time, the dog's owner picks it up and spends some time with the trainer learning to handle the dog. Boarding and training a dog is a lot like sending a child to summer camp. Once your dog is there, you won't be able to supervise it every day, so it's important to do your homework beforehand. State licenses and permit requirements vary state by state. Check with your local municipality to find out more and check on the facilities status. You'll want the board-and-train facility to be licensed and bonded. Speak with previous clients for a referral. Make sure you have some positive recommendations and can even see the previously trained dogs in person. Your dog will be spending up to several weeks at the training facility. Make sure you get to see the areas where the dog will sleep, play, and spend time training. Meet the dog trainer and anyone who will be interacting with your dog. Spend time talking to the dog trainer and observe the trainer in action if possible. This will give you an idea of the trainer's methods, as well as what you can expect by the end of the program. 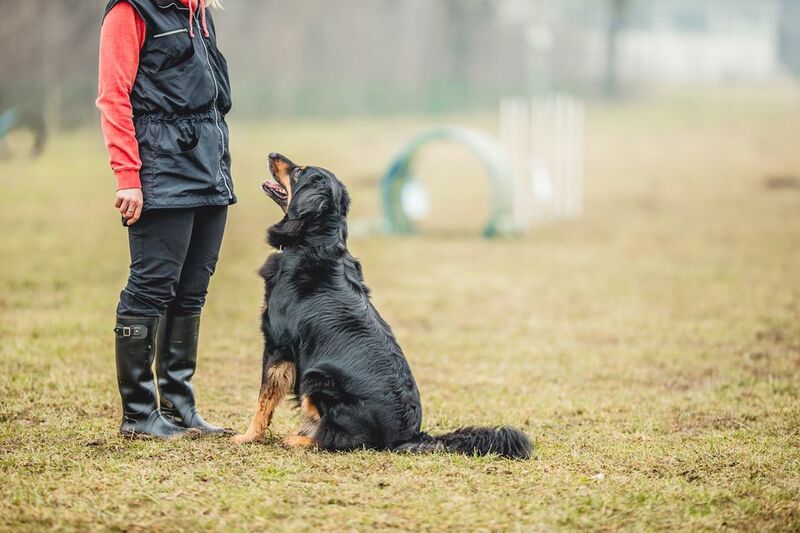 With a reputable training facility, the dog gets lots of training, exercise, and mental stimulation, creating the perfect environment to produce a well-trained dog. Review all costs, too, as training facilities can be very expensive. Make sure you are committed to being a part of the process. Even though you're leaving your dog to be trained without you, you are still going to play an important role in the process. You need to make a commitment to work with the trainer and learn to handle your dog to practice what your pet has learned. Without this commitment on your part, everything the dog learns while its away will be out the window once you get home. You'll want a commitment from the trainer that they will provide clear and consistent rules for the dog which the dog owner can put in place once the dog is back home. When you get home, if you don't follow along with the training as set forth by the trainer, you will not be able to elicit the same good behavior from your dog. Make sure the trainer offers some sort of follow up that allows you to get in touch with questions or concerns after you bring your dog home. Make sure you consider many options when it comes to training your dog. Talk to your veterinarian and other dog owners to get various options. Do plenty of research first so you can make an informed decision. You run the chance of spending a lot of money on ineffective training. There are a number of dishonest dog trainers who offer this service. If you don't do your homework beforehand to find the right place, your dog can end up spending several weeks languishing in a kennel, only to be pulled out in the last few days to work on training. Finally, you need to make sure the training style fits your personality and lifestyle. If you are unable to proceed with how your dog has been trained, you will have wasted time and money and confused (and possibly harmed) your dog. Can Your Dog Be a Therapy Dog?